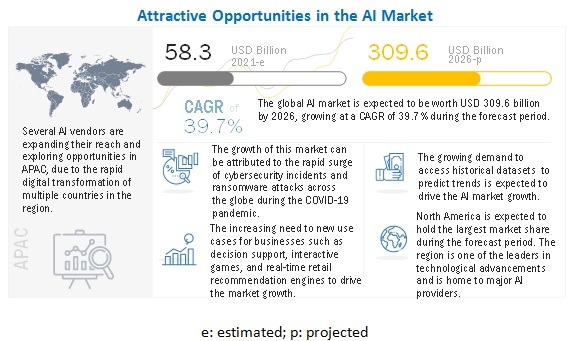 [222 Pages Report] The artificial intelligence market was valued at USD 16.06 billion in 2017 and is expected to reach USD 190.61 billion by 2025, at a CAGR of 36.62% during the forecast period. The base year considered for the study is 2017, and the forecast period is between 2018 and 2025. This research study involves the use of secondary sources, directories, and databases (such as D&B Hoovers, Bloomberg Businessweek, Factiva, and OneSource) to identify and collect information useful for the extensive technical, market-oriented, and commercial study of the artificial intelligence market. Primary sources mainly comprise several experts from core and related industries, along with preferred suppliers, manufacturers, distributors, service providers, technology developers, alliances, and standards and certification organizations related to the various parts of this industry’s value chain. In-depth interviews with various primary respondents, including key industry participants, subject matter experts (SMEs), C-level executives of key companies, and consultants, have been conducted to obtain and verify critical qualitative and quantitative information, as well as assess prospects. The breakdown of the profiles of primaries has been depicted in the below figure. This report provides valuable insights into the ecosystem of the artificial intelligence market. The major players in this market include Intel (US), NVIDIA (US), Xilinx (US), Samsung (South Korea), Facebook (US), Micron Technology (US), IBM (US), Google (US), Microsoft (US), and AWS (US). The artificial intelligence market is expected to reach USD 190.61 Billion by 2025 from USD 21.46 Billion in 2018, at a CAGR of 36.62% during the forecast period. The artificial intelligence market growth is mainly driven by factors such as the increasing adoption of cloud-based applications and services, growing big data, and increasing demand for intelligent virtual assistants. The major restraint for the market is the limited number of AI technology experts. In this report, the size of the artificial intelligence market has been arrived at based on segments such as offering, technology, end-user industry, and geography. On the basis of offerings, the artificial intelligence market has been segmented into hardware, software, and services. The adoption of AI is rapidly increasing in various applications. As AI is a complex technology requiring the implementation of sophisticated algorithms, AI-based systems require deployment and integration, and support and maintenance services. Also, most companies that manufacture and develop AI-based systems and related software provide both online and offline support, depending on the application. On the basis of technologies, the artificial intelligence market has been segmented into machine learning (ML), natural language processing (NLP), context-aware computing, and computer vision. The artificial intelligence market for computer vision is expected to grow at the highest CAGR. The growing adoption of computer vision in autonomous and semiautonomous applications in various industries, such as manufacturing and automotive, is propelling the growth of this technology in the AI market. The market has been segmented on the basis of end-user industries into healthcare, manufacturing, automotive, agriculture, retail, security, marketing, human resources, law, and fintech. Of all the end-user industries, the artificial intelligence market for manufacturing is expected to grow at the highest CAGR during the forecast period. Increasing data volume derived from the manufacturing value chain has led to the involvement of AI-enabled data analytics in the manufacturing sector. In addition, several industry initiatives, such as Industry 4.0, a connected manufacturing initiative by the Government of Germany, have proliferated the growth of AI-enabled devices in manufacturing. 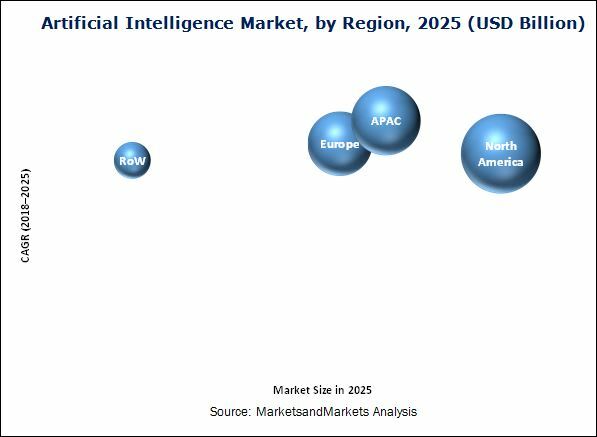 On the basis of geography, the artificial intelligence market has been segmented into North America, Europe, APAC, and RoW. The artificial intelligence market in APAC is expected to grow at the highest CAGR during the forecast period. This growth can be attributed to the increasing adoption of deep learning and NLP technologies in finance, agriculture, marketing, and law applications in APAC. Moreover, the presence of major players in the artificial intelligence market ecosystem results in the increasing adoption of these systems in APAC. However, the limited number of industry experts for artificial intelligence market is a major restraint for the market. The key players in this market focus on organic growth strategies, such as product launches, to expand their business and related offerings. Some of the players in this market are Intel (US), NVIDIA (US), Xilinx (US), Samsung (South Korea), Facebook (US), Micron Technology (US), IBM (US), Google (US), Microsoft (US), and AWS (US).